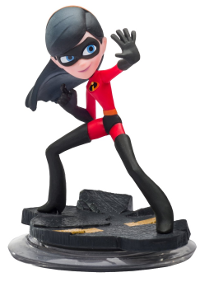 Below is a complete list of the known Disney Infinity figures. As figures, colors, and rare variants are released they will be added to the list. Click the name of the character to see a picture and the most recent prices. Disney Infinity releases on August 18th for Wii, Xbox 360, Playstation 3, Nintendo DS, Nintendo 3DS, and Wii U. It is a video game that brings action figures and games together through the "Infinity Base" a device that transfers the figurine into the virtual world. It is very similar to Skylanders. Prior to launch there are 26 known figures for the game with many more guaranteed to be released in the months and years after launch. Skylander's figures became popular collector's items soon after it launched. 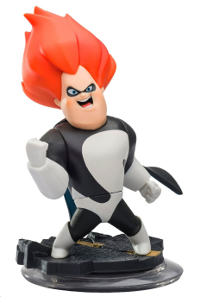 We will have to wait and see if Disney Infinity characters become rare and collectible too. The game premise for Disney Infinity is very similar to Activision's Skylanders series of games. You use physical figures to load characters into the virtual game. 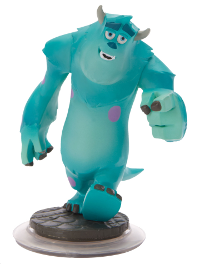 For instance, if you have a Sully figure you can play as Sully in the game. Unlike Skylanders, Disney Infinity allows for the use of "Power Discs", which add vehicles, weapons, and themes to the game as well. You attach these Power Discs to the base of a figure before loading them into the game with the "Infinity Base". Infinity has two main game play types - platforming and racing. There is also a "Toy Box" mode that allows you to combine characters, pieces, and levels and create your own world to explore and play in. Disney Infinity copied much from the Skylanders game concept, Disney even mentions Skylanders multiple times on their website when discussing features of the game. Their marketing playbook looks very similar as well. They have developed an extensive website with videos, screenshots, and details about the game. Disney has started airing commercials on children's TV channels too. They have yet to do major tie-ins with fast food or snack companies, but those are sure to follow. Activision helped push the collectible nature of Skylander's characters by making chase variants - figures that are harder to get than others. They will often be a different color or made from a different material. This encouraged people to hunt for the figures and try to collect them all. Disney has not announced any rare variants, but they are using another tactic used for Skylanders figures - waves of characters. Instead of releasing all possible characters at launch, the figures come out in waves. The first wave are the launch characters. Then a few weeks later will be another wave of figures. Followed by more a month or more after that, until all the figures compatible with the game have been released. This keeps interest in the game going because there is always something new coming out. Disney has tried to keep the character information quite so people don't know which characters will be available and when. The launch characters are all known, but there are already rumors about Waves 2, 3, and beyond. The rumors include a Mickey Mouse figure and figures from the winter 2013 movie Frozen. 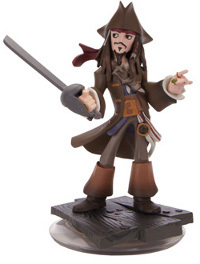 Disney Infinity is rumored to be using store exclusives just like Skylanders does. A particular figure might be available only through GameStop, while another can only be found at Wal-Mart. All of these tools are used by Disney make the characters appear collectible. It remains to be seen if Infinity will be as popular as Skylanders or as collectible, but Disney is taking all the right steps to make it happen. Infinity does have something Skylanders never did - a huge list of famous characters that everyone already recognizes and loves. Disney has an almost endless supply of characters they could add to the game including Star Wars, Marvel Comics, Pixar cartoons, and Disney cartoons. Thanks for heads up. Didn't see it coming! Didn't get into skylanders, not a spyro junkie, but I love Disney characters...would love to see all the princesses capable of fighting (little mermaid, Cinderella, snow white, etc). I may get into this one. I find this stuff so addictive, I'm sure Disney will execute it well too. Is there any price information out there? @anonymous - Great question. The Infinity Starter Packs - game, base, and three starter figures - costs $79.99. Sets of three characters cost $29.99. The Infinity prices are a bit more than standard sized Skylanders figures, but less than Skylanders Giants figures. I wish they would put Neverland! That would be a cool theme! They should also make characters such as the princesses, lady and the tramp, Peter Pan, etc. movies. I don't like the fact that there is only like 7 movies at the most. I know it costs much for the characters to be processed, but I bet they would make a lot more money with feminine characters, or characters that adults would like, such as classic movies. Need to add Crystal lightning McQueen to the checklist. It's a TRU exclusive, semi-translucent figure. @anonymous - Great idea for the Neverland theme. I bet most of those characters you mentioned will be added at some point. In future waves of characters. @JM Campbell - Thanks for the heads up. I have added the crystal McQueen to the list and have a section for all the Infinite Crystal series characters. What about Randy Cunningham(RC9GN)? I would love to play as him! @anonymous - If Infinity is successful I bet Disney will go pretty far back into their catalog of characters. I'm not sure if Randy Cunningham would be popular enough, but you never know what Disney will decide to do. If Infinity is really popular they could use it as a way to market other Disney properties instead of using other properties to market Infinity.